or, how we changed several wet martinis into dry martinis. If you are a martini purist, please don’t read this. If you do, please don’t judge us harshly. Wet martinis made with Seagrams Extra Dry gin from an earlier experiment are unbalanced, and not really enjoyable. Can the less-than-exceptional wet martinis be “dried out” to create a more enjoyable beverage? It is expected that the re-mixed martinis will be better than the wet versions, and will be perfectly suitable to enjoy with a new episode of Doctor Who. pour the combined, Italian vermouth-ed, martini into a shaker that has 4 ice cubes. We did not have 8 ounces of Seagram’s Extra Dry gin to complete this experiment. Thus, the 4 ounces of gin was composed of 1 ounce of Seagrams, plus 3 ounces of Broker’s Gin (its got a cute plastic bowler hat on top of the bottle). 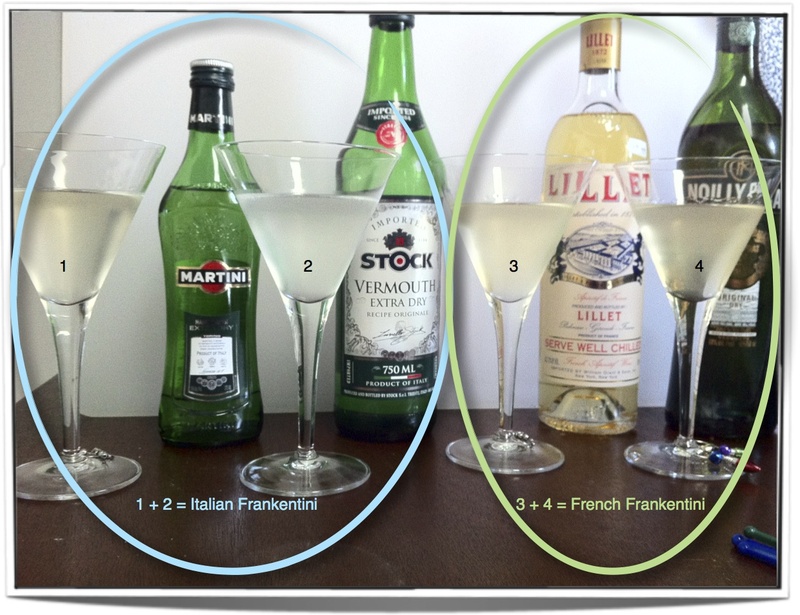 Due to each newly created martini being composed of 2 brands of vermouth and 2 brands of gin, these have been dubbed “Frankentinis”. The Broker’s Gin is higher proof than the Seagram’s (94 vs 80), so these frankentinis had more bite than what would have resulted if only Seagram’s had been used. Two of the tasters preferred the French vermouth-ed frankentinis, while one preferred the Italian style. It was noted that the sweetness of the French vermouths (Lillet blanc and Noilly Prat) created a more rounded drink, where it took off the harsh edges (burn) of the gin. The taster who preferred the Italian frankentini, agreed with the rounding aspects of the French vermouths, but thought it was a little too sweet. The lesser sweetness of the Martini & Rossi vermouth, coupled with the not-sweet Stock vermouth, made for an Italian frankentini that was dry, crisp, citrusy, and spicy. It is possible to rectify an unbalanced wet martini, and the combination with a new Doctor Who episode was perfectly enjoyable. None from this tangent (other than, what is at the heart of the Tardis? ).